What’s the worst thing about cutting the cord? No, it’s not missing out on live network TV, of course. Everyone knows that all you need is a $25 OTA antenna and you can get live network TV in Full HD for free. The worst thing is losing your DVR features for live TV, but luckily there’s a surprisingly affordable box that gives you DVR features for OTA TV. 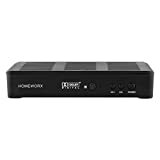 The Mediasonic Homeworx HW180STB costs just $24.99 on Amazon, and it lets you record live TV and even schedule recordings just like your old cable company’s DVR. Auto Tuning, HDMI 1080P Output / Composite Out / Coaxial Output, Closed Caption,Real-Time recording & Programmed Time Recording, Auto, 16:9 Pillar Box, 16:9 Pan G Scan, 4:3 Letter Box, 4:3 Pan G Scan, 4:3 Full, 16:9 Wide Screen. Timing Start Up & Shut Down. Recording require user to connect a USB 2.0 or USB 3.0 2.5″ / 3.5″ External Hard Drive via USB (Up to 2TB). Note that you’ll need an external hard drive or a flash drive since the device doesn’t have any internal storage, but flash drives are very cheap on Amazon. Here’s a flash drive with 128GB of storage for under $30, and here’s a 1TB external hard drive for $55.